When you’re in the building stage of a new RES Workspace Manager environment you have to test new settings and new applications very often. Sometimes you can be a little too fast with the Refresh Workspace action. The cache on your test client has not updated yet so when you’re testing the modifications it can seem like it’s not working. The only way to be sure is to force a cache update from the console. I find it annoying to have to leave the section I’m modifying in order to update the clients cache and then go back again, especially if it happens a few dozen times a day! Would’t it be great if we could force a cache update from the client with the click of a mouse button? 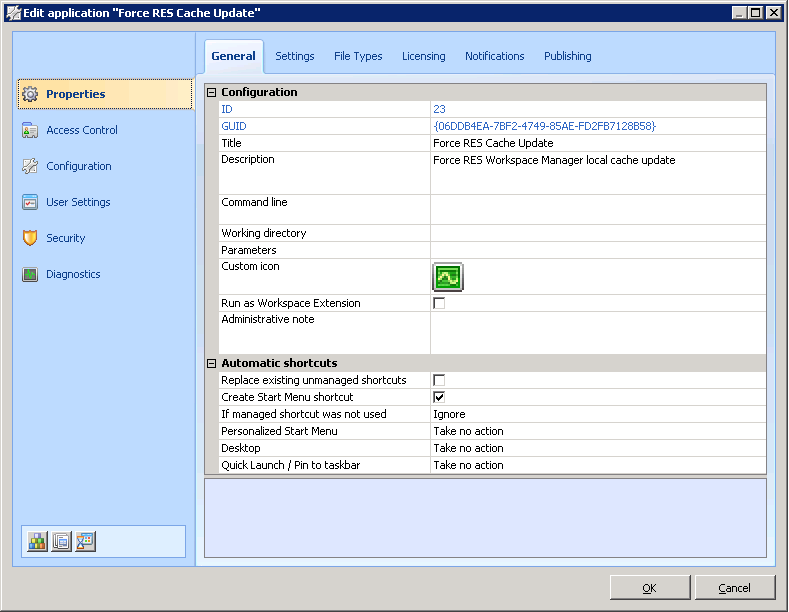 Unfortunately there’s no command line option to force a cache update like there is for Refresh Workspace. I’ve requested this feature in RES Uservoice a while ago but there aren’t enough votes yet (help!). Note that the powershell command has to be run with the -executionpolicy Bypass parameter in order to run properly. We need to check Dynamic Priviliges since the script involves hacking the HKLM registry and we need to check Wait for task to finish… because we’ll add a second command later (also if you check Dynamic Privileges the script won’t run properly without the Wait option checked). Now on to the script itself. The trick is to understand the cache update process. 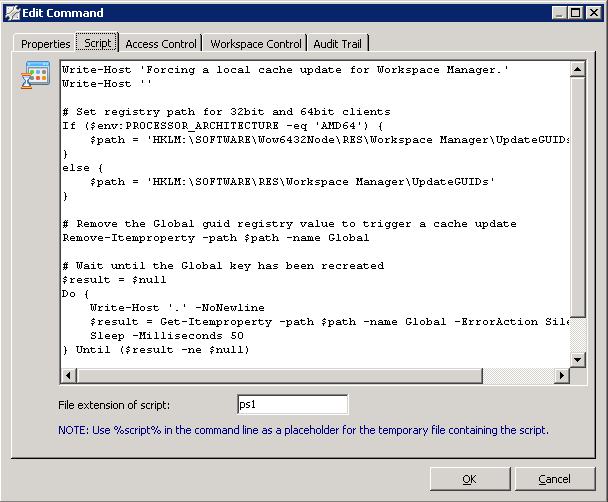 There is a specific registry value that the Workspace Manager agent checks to see if it has the latest cache version. This is determined by checking the GUID in the data of this registry value and comparing that with the GUID in the Datastore. How often the value is checked depends on your agent settings in the Workspace Manager console. However, if we delete that registry value the agent is triggered immediately, updates the cache and restores the registry value with the new GUID data! So the script will begin by letting the user now what’s going on and then determine which path os needed for the client. There are many ways to do that but I like to use the PROCESSOR_ARCHITECTURE environment variable. That’s what it’s there for, right? I realize everyone who reads this must be wondering: Can I just get a Building Block of this marble? The answer is: Yes you can! If you prefer the script method I described it’s available right here. If you want the executable you can get it here. Just place the exe in the Custom Resources folder and create the application. Don’t forget to add Administrative rights to the application. Hopefully you’ve found this useful. Feel free to comment on this blog, it’ll be appreciated. This entry was posted in Powershell, RES Workspace Manager, Sapien Powershell Studio and tagged local cache, Powershell, Powershell Studio, RES Software, RES Workspace Manager, Sapien, scripting, update cache, Utilities, Windows PowerShell. Bookmark the permalink. Link for the exe appears to be broken. Would you be willing to repost it or email it to me? Thanks! I tried to execute the EXE in an x86 Win7 View desktop, logged in as an admin, and it threw the following error – “The version of this file is not compatible with the version of Windows you’re running.” Any idea why it would say that? Hi Darren. I made that executable a while back so I’ll need some time to check. I’ll get back to you on this. Thanks for the great article! Although is a bit older is still applies and helped me out!